KATHMANDU, June 17: The government's plan of bring in a million foreign tourists remains a pipedream even though it has already been six years since the plan was unveiled. While announcing Nepal Tourism Year (NTY) 2011 in 2008, the government had set a target of bringing million foreign tourists annually by 2011. But the target is still elusive. Foreign tourist arrival has been decreasing continuously since 2012. According to Nepal Tourism Statistics prepared by Ministry of Culture, Tourism and Civil Aviation (MoCTCA), altogether 803,092 foreign tourists visited Nepal in 2012. The number fell to 797,616 in 2013 and 790,118 in 2014. And in 2015, arrivals declined sharply to 538,970 tourists due to impacts of the 2015 earthquakes and six-month Indian blockade. Though arrivals recovered in 2016, posting a growth of 32 percent compared to figures of 2015, it is still below the levels of 2012 and the target set for the NTY. In 2011, when the national campaign was observed, only 736,215 foreign tourists visited Nepal. Experts blame low tourist arrivals to lack of effective promotional campaigns and international arena. 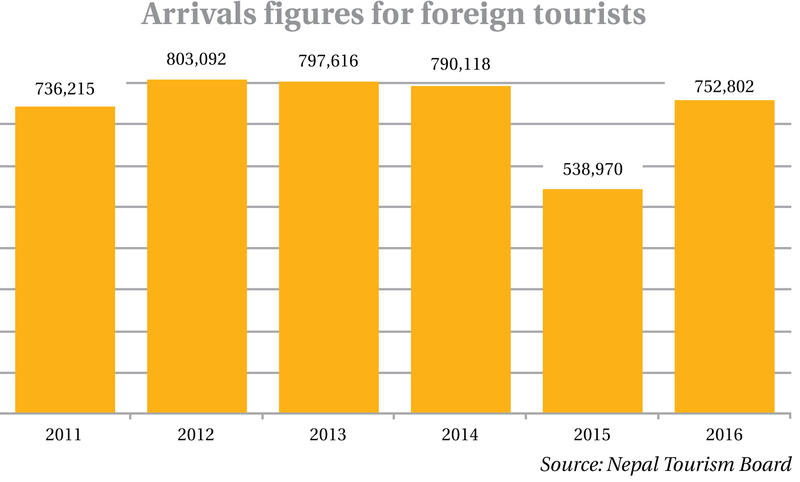 Talking to Republica, former CEO of Nepal Tourism Board (NTB), Prachanda Man Shrestha, said arrival figures between 2007 and 2012 was growing at a healthy rate. “The promotional campaigns starting from 2008 and NTY 2011 was itself a good one. But they were discontinued in the following years,” added Shrestha. President of Hotel Association of Nepal (HAN), Amar Man Shakya, however blamed lack of needful infrastructure and fewer aircraft with the national flag carrier, Nepal Airlines Corporation (NAC), as the main reasons behind the country's failure to meet the target of welcoming one million visitors. “We, the private sector, have the capacity to bring tourists. Tourism stakeholders are hopeful that things will improve for the tourism industry after the local level elections are held. Durga Dutta Dhakal, the information officer with the Department of Tourism (DoT), however, said that tourism is on the recovery path. “It is true that tourist arrival fell in the past few years. The earthquakes and blockade also affected our recovery efforts. But it showed remarkable recovery in 2016,” he added. Saying that most of the hotels across the country are full of tourists and that tourist footfall is increasing, Dhakal said he was optimistic of the country's tourism prospect this year. He also said that government was working to see what can be done to do away with infrastructure constraints. “Our main focus is on exploration and promotion of new tourist destinations and promote tourism in rural areas,” he added. Former NTB CEO Shrestha pointed out that the government and private sectors should work hand in hand to bring more tourists. “The government should develop infrastructure and devise favorable policies focusing on more promotional programs,” he added. “The government has set a target of bringing in two million tourists by 2020. We are devising plans and policies keeping that target in mind,” Dhakal added.